Bird Box Vs. A Quiet Place: Which Was Better? After watching just a few seconds of the Bird Box trailer in December, I noticed an uncanny similarity to another movie I had seen earlier in 2018: A Quiet Place. If you haven’t seen these films, A Quiet Place revolves around monsters with supersensory hearing, while Bird Box features an enigma that attacks when it is seen. In response, characters must either be silent or keep their eyes covered when outdoors, respectively. Both were very suspenseful and intense thriller-horror films, but if you’re anything like me, it was hard deciding which one is better! Here, I take a deeper look into what makes these thriller movies so alike yet so astoundingly different. A prominent theme in both of these movies is the main characters’ challenge in protecting their children from the dangers of the world. We learn at the beginning of A Quiet Place that the family has lost its youngest member and that the mother is pregnant again. Both the mother and father in this movie are very nurturing and loving towards their children. The parents teach their children things, play games with them, and try to make sure their children’s lives are as full as they would have been without the current crisis. While the main character Malorie is also pregnant at the beginning of Bird Box, that is about as far as the similarities go in respect to the children in this movie. Malorie is unattached to the baby growing inside her and unwilling to have a child. Her reluctance about her pregnancy starkly contrasts with Olympia, another pregnant survivor who is ecstatic to meet her baby and romanticizes the notion of motherhood. Malorie begrudgingly promises she will take care of Olympia’s baby if anything happens to her and, sure enough, is forced to follow through on that promise after Olympia’s death. Unlike in A Quiet Place, however, the children in Bird Box are severely deprived are treated with harshness rather than with love. Malorie never names them for fear of becoming attached to them, and scolds her partner Tom for filling their heads with dreams of climbing trees and playing with other children. Characters in both movies must get creative in order to either be silent or keep their eyes covered. 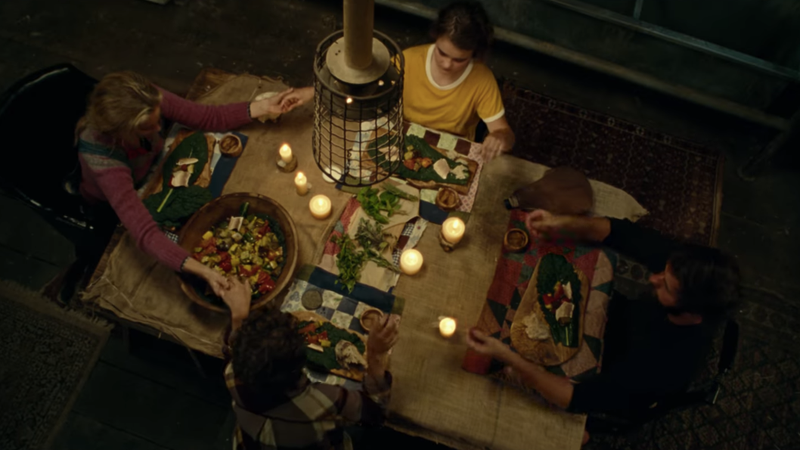 A Quiet Place shows how sand is placed on floorboards that don’t squeak, noisy dishes aren’t used during dinner, and felt is used in lieu of regular game pieces. However, I personally thought it was more creative and scarier to watch as Bird Box showed how characters tried to avoid using the sense of sight. The most gripping and disturbing scene by far was when the refugees drove to the supermarket guided only by the car’s GPS system. One of the biggest unanswered questions of Bird Box is what exactly caused people to kill themselves. We are left unsure of whether it is a physical enigma that manifests when characters’ eyes are exposed, or if it is simply a figment of their imaginations. On top of never actually seeing whatever it is that is wreaking havoc, we are also given the impression that each character is haunted by something different before dying, adding to the confusion. Although A Quiet Place leaves less to the imagination in the way of its monsters, I, as the viewer, personally felt more suspense and fear surrounding their threat to the characters. Anticipation for the creatures’ appearances builds as we learn more about them throughout the beginning of the movie. When we finally catch a glimpse of them in all their horrific glory, it is that much more frightening. In the end of the movie, we are also given the satisfaction of learning the key to the creatures’ demise, unlike how Bird Box never fully explains what the antagonist is, let alone how to destroy it. Ultimately, A Quiet Place leaves one thought in mind at the end of the movie: What would you do for your children? It is filled with raw emotion and selfless acts of love that demonstrate this theme, clearly defining it as such. In contrast, Malorie’s reluctance to motherhood in Bird Box first and foremost reminds the viewer of the struggle of raising children in a world that seems to be constantly decaying. Additionally, the way Malorie deprives her children of any notion of childhood is accompanied by a religious undertone. Their long journey to the safe haven is reminiscent of a believer’s quest for heaven, preceded by a series of temptation and a struggle to resist sin. The motifs presented by Bird Box are more clunky than A Quiet Place, making the viewer question what the film’s theme actually is. Although both of these movies were absolutely amazing, I decided (after a lot of deliberation) that my favorite of the two was A Quiet Place. After all, John Krasinski starred in it and wrote it, and he and his wife Emily Blunt make an unstoppable duo both on-screen and off!